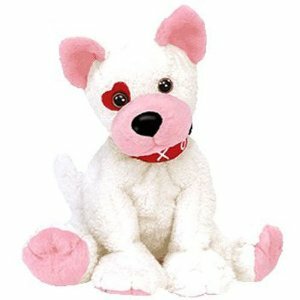 Cupid is made from a fuzzy white material with a light pink material for the inside of his ears, his muzzle and paws. He has gold and black button eyes and a black nose with a red heart over his right eye. He wears a bright red collar around his neck with “X O X O X O” in white writing on it. This represents “hugs and kisses”. His kisses are a Valentine treat! Cupid was released on 30th November 2001. His birthday is on 14th February 2001. He is a Valentine’s themed Beanie Baby. There is also a version of Cupid with the red heart over the left eye. He retired on 18th March 2002.